A newspaper covering a matter of great interest to the city and nation. 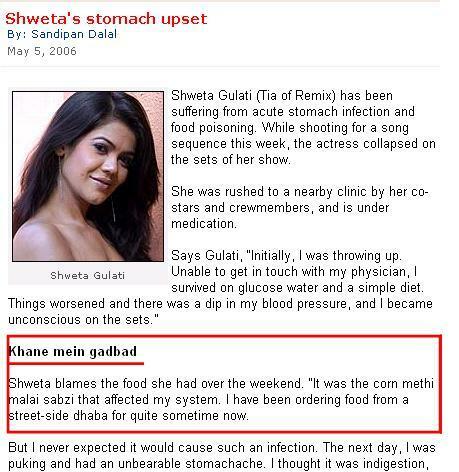 Some Shweta person (some actress, i guess) had a bad tummy upset and couldn't continue shooting for some film/serial/whatever. Ok fine. But 300 words spent on covering it! And gets into real nitty-grities...sample (no pun intended) the stuff i've put in the red block above with the sub-heading as 'Khane mein gadbad' lit. 'Something's wrong with the food'. Even writing about it makes me feel miserable. Why does anyone have to know that she had 'Corn methi malai sabzi' (and over the weekend, may i add). Then we are fed (again, no pun intended) the gory details - that she puked the next day, unbearable stomach-ache...it just keeps going on an' on, man. In the last part of the article, Ms. Shweta bravely proclaims to the world at large that 'Stomach problems have become a part of her life' - under the creative sub-heading 'Weak Tummy'. Interesting. What else is part of your interesting life? Also to note is that 'My mother lives in Thane and has been getting very paranoid about my health'. hmmm. If she had lived in Lokhandwala, she wouldn't have been worried about Ms. Shweta's health. best part is that I chanced upon this when going through the 'Today's newsbreakers' section of a daily online media newsletter i subscribe to. This is a newsbreaker? Kaliyuga indeed. The reporter files an 'Exclusive Report'. He will get a hefty bonus this year for filing an exclusive report. Tomorrow, you may see a news item that would read like this: "Tommy, a stray dog from lokhandwala, dies of heart attack. He was 10 years old. Shocked by his death, Sandeep, a resident of Lokhandwala Complex, a posh locality in Andheri said, he never expected tummy go leave him so early in life. He used to bark at strangers and protect us. He also added that Lokhandwala resident's association will change the 4th cross lane to be named after their beloved dog 'Tommy'. It will now be called as Tommy Chouk.